Today sees the IV Ciudad de Huéscar cross-country race which will offer a panoramic route through the Sierra Bermeja for the competitors. This type of race, taking in the mountains and valleys, is becoming more and more popular, precisely because of the views taken in along the way. The event has been organised by the Húescar Town Hall and the Provincial Council. 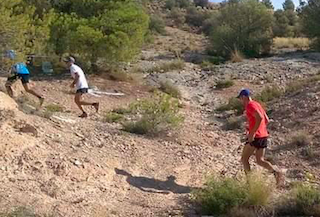 Those competing can opt for one of two routes: the 22.3 km route with a climb of some 711 metres, or the mini route of ‘only’ 13.2 km with a 545-metre height difference, which is better suited for hikers rather than Rambo on steriods. The starting and finishing line is next to the municipal sports facilities and to participate it costs 12 euros for local athletes. There’s a rice dish for those that survive the ordeal. This entry was posted on Sunday, April 7th, 2019 at 7:49 am	and is filed under Alti Plano. You can follow any responses to this entry through the RSS 2.0 feed.